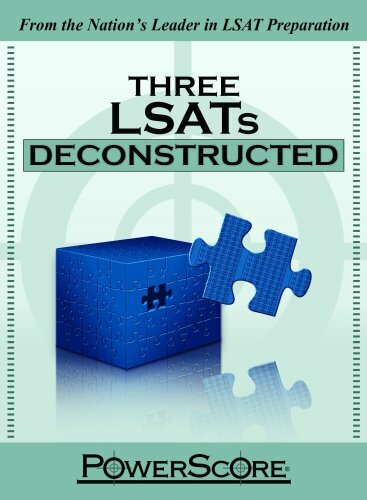 The PowerScore LSAT Deconstructed Series: Three LSATs Deconstructed is a comprehensive, question-by-question analysis of the official June, October, and December LSATs from 2004 – over 300 questions in all! PowerScore strongly believes that studying the logic behind each question will enable you to recognizing patterns present within the LSAT, and significantly increase your ability to perform well on the LSAT. The concepts presented in the PowerScore Three LSATs Deconstructed are representative of the techniques covered in PowerScore’s live courses and have consistently been proven effective for thousands of students. ● A detailed classification of every question type that appeared on the released 2004 LSATs, and explains exactly how PowerScore’s advanced techniques can be applied to each of these questions. ● For Logical Reasoning, the book covers every major reasoning concept that test takers are likely to encounter; everything from Conditional Reasoning to Causality to Formal Logic is addressed in depth. Comprehensive diagrams are also provided when appropriate so that test takers can better understand how and when to notate stimulus information and formulate the necessary inferences. ● For Logic Games, the book gives detailed methodology for attacking all aspects of the games, including recognizing game types, the proper way to represent rules, the methods for efficiently and accurately making inferences, techniques for solving each question, and a discussion of each answer choice, right or wrong. ● Also included is a brief overview of each section on the LSAT, information on how the LSAT is scored, uses of the LSAT in law school admissions, and how to approach each section of the test, plus a glossary of terms, and a brief overview of the concepts that appear on the LSAT. The use of real questions while preparing is essential to your success on the LSAT, and no question in this book has been modified from its original form. If you are looking to further improve your LSAT score, we recommend that you pick up a copy of the renowned PowerScore LSAT Logic Games Bible, PowerScore LSAT Logical Reasoning Bible, and PowerScore LSAT Reading Comprehension Bible. When combined, the three bibles provide a formidable methodology for attacking the test.